I read a glowing review of North restaurant last year in the Globe; Derva First said that the restaurant “blew her mind,” with their “Asian flavors, sliced apart and recombined with boldness, humor, and intelligence,” North is the brain child from three cooks who met at Johnson & Wales, including one that worked at Momofuku. This sounded perfect for my traditional Nationals “Dinner with Dr. Marc,” They do not take reservations, so we waited outside in the pouring rain with a crowd of other hungry hopefuls. At 5:31pm, the doors opened and we poured in to claim the 30 seats available. The menu is small, ranging from $9 to $15, with one large plate of fried chicken for 2-4 ($38). Our server suggested that we order 4 plates to start, but Marc and I could not limit ourselves to 4 – we ordered 6, plus dessert. 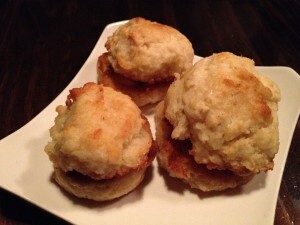 We started with the Tiny Ham Biscuits ($6). They were inconsistent in size, but the biscuits were excellent, cooked, filled thickly sliced country ham, brushed with mustard and then griddled again. They were a perfect little snack, until Marc found a hair in his. The server was appropriately apologetic and we were comped the dish, as well as a second round of drinks. 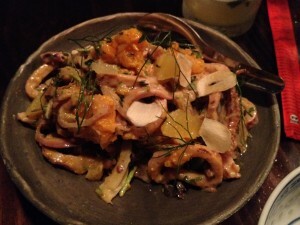 Next was the Marinated Squid & Citrus salad ($10), a delightful mix of tender rings, refreshing citrus supremes, and braised fennel. The flavors were interesting and complex. I loved the scallop dish ($14): perfectly seared and seasoned scallops, tossed with ribbons of kohlrabi and dots of quince jam. I used quince in a recipe recently, and it might be my new flavor ingredient. Derva loved the Dan Dan noodles ($11), as did Marc, but I was disappointed by their rendition. They use Korean rice cakes instead of actual noodles. Although the cakes were pleasantly chewy, when I order noodles, I expect noodles. 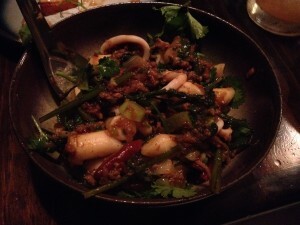 The rice cakes were tossed in a spicy goat and squid ragu. I wished we had ordered the hot sesame noodles instead. The monkfish ($12) was excellent; the firm, meaty flesh was complimented by a smoky carrot puree, shredded persimmon and topped with sunflower seeds. 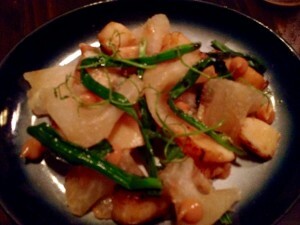 It was another complex, interesting dish, turning flavors upside down. 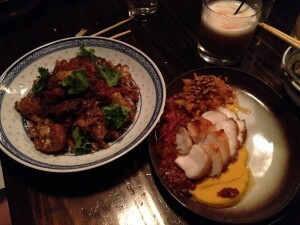 The cauliflower and crispy pork dish ($12) was the disappointment of the night. There was nothing inherently wrong with the dish; it was just flat and boring compared to the dishes that preceded it. I did like the touch of sweetness the apple butter added to the dish. 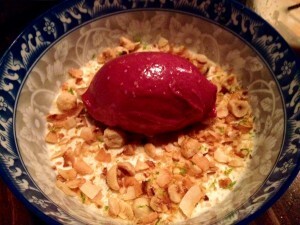 We were full, but when we heard the one dessert option ($8) was coconut panna cotta, layered with coconut flan, topped with concord grape sorbet and sprinkled with toasted coconut shreds and crushed hazelnuts, we had to try it. It was excellent and worth the stomach space I didn’t have. We tried four different craft cocktails and all were enjoyed. The server was attentive and friendly. It was a great meal and will certainly make my top 2014 meals.